If you succeed go on; if you failed keep going and don't give up. Madi Preda was born in Romania, grew up there, under Dracula myth and the communist regime. For many years, she was working as an accountant in Galati and then moved to Greece, in 2007. After seven years, she is back in Romania, and now lives and works in Brasov. 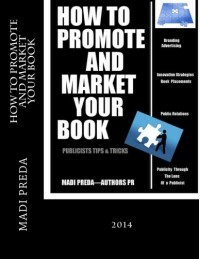 Her first book, How To Promote and Market Your Book explores how Marketing and PR can differentiate an author from others in attracting and retaining more readers. My advice is: read the entire book; digest it and study it again, chapter by chapter. If this had been around at the time I self-published my first book, my own story as an author might have a happy ending! Yet, I struggled through various strategies, alone, with little or no advice – and at a time when the only tips came from forums. So yes, there are strategies in this book which I have stumbled across anyway (through networking on Facebook, Twitter, and Goodreads) for example, some of the suggestions for getting reviews.